Millions of migratory birds nest in the watershed of the North French River in Ontario’s Boreal Forest. At least 165 bird species either nurture their young or stop to bulk up during migration in this pristine watershed, the last in the region undisturbed by industrial development. Many of these birds are now settling for the winter near your backyard or a local park. Won’t you take a moment to be a voice for boreal birds? 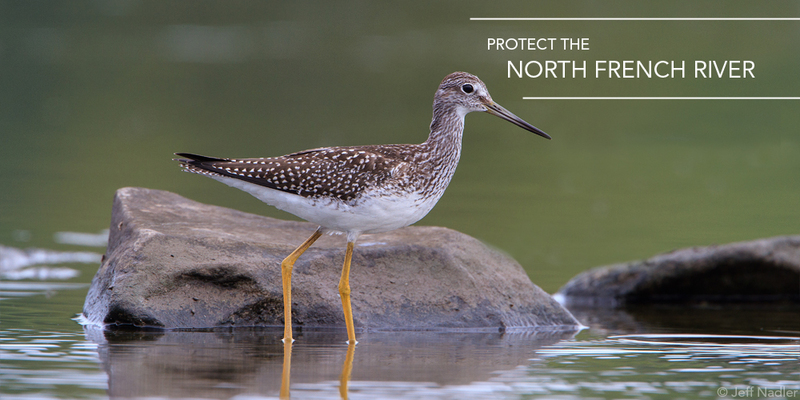 Ask the Ontario government to protect this bird-rich habitat today. Sign our letter to Ontario’s Premier Kathleen Wynne below, or chirp your support using our social media options to the right. I am writing to urge you to protect the North French River and nearby South Bluff Creek watersheds, some of the last remaining pristine waterways in Ontario. The untouched nature and diverse habitats of these waterways make them crucial nesting grounds for migratory birds. At least 165 different species of migratory songbirds, shorebirds, raptors, and waterfowl nest in these watersheds, including threatened species like the Canada Warbler and Olive-sided Flycatcher. These watersheds are located within the Boreal Forest – "North America's bird nursery” – where nearly half of all North American bird species nest and raise their young before migrating south for the winter. Many bird populations are in steep decline, and keeping their nesting grounds in the North French River watershed and South Bluff Creek largely intact will nurture millions of birds during their most vulnerable stage of development. These areas also provide a refuge for bird species pushed northward as they struggle to adapt to a warming climate. We support Moose Cree First Nation’s declaration that the watersheds be protected from resource development activities. We urge the government of Ontario to permanently protect the ecologically and culturally significant North French River and South Bluff Creek watersheds. Let the Premier of Ontario know you support protecting the North French River by tagging her in a post or tweet. Dear @wynnefans, I urge you to protect the North French River watershed. This pristine landscape provides refuge for at least 165 different bird species. 2. Make sure the Premier’s tag is working. You’ll need to press the space bar after the ‘s’ at the end of “@wynnefans” to display her public profile for you to select. (It may appear as if the tag is removed after you post, but a notification will still be sent to the Premier). Check out our recent blog to find out more about the region, the birds that depend on it, and why Moose Cree First Nation wants to see it protected.